The Ivorian charge d'affaires asked Inner City Press what now should happen to Laurent Gbagbo, who had appointed him. His interlocutor, another African Permanent Representative, predicted that Gbagbo will try to stay in power a la Robert Mugabe. 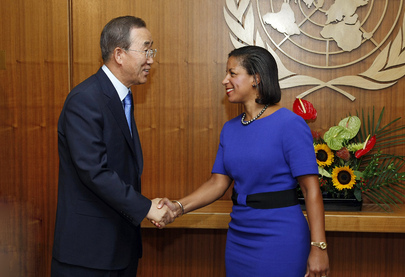 The Ivorian invitation, it was argued, was sent before Gbagbo ignored the election results, and the remnant Deputy Ambassador wasn't part of the “dark side.” But he was plotting how Gbagbo could stay in power, in Susan Rice's living room. This is diplomacy at the UN. The crowd was laudably eclectic, including the Special Adviser for the Responsibility to Protect rushing to catch a train for Westchester, the Special Representative on Sexual Violence and Armed Conflict and a slew of Ambassadors, many of whom had stopped first at a Kazakhstan event. There was some talk of upcoming UN budget fights, and more of WikiLeaks. The Ambassador of Serbia, a long time UN employee from Georgia and India, bragged about his country's Davis Cup tennis win over France. The Ambassador of Palau, from the Upper West Side, talked up his wife's country's move to create a sanctuary for sharks. Tajikistan is taking the chair, at least in New York, of the Organization of the Islamic Conference, which sides with Sudan's Omar al Bashir over the International Criminal Court. “I am only the chair,” the Tajik Ambassador told Inner City Press. Israel's Ambassador also spoke at length, which may be a separate story. In the US Mission residence's dining room there was turkey, ham and cheese and slew of ASGs, from Human Resources to ACABQ. Interesting art on the walls was said to be on loan for a program for US Embassies. The full USUN team was in the house, from the spokespeople to Rosemary DiCarlo through Brooke Anderson to Rick Barton and Ambassador Melrose, who covers the Budget Committee. Even in the US, schools are on hiatus when the event is being held. We'll see who shows up, and what scholarships are provided. It was a friendly event full of holiday spirit. 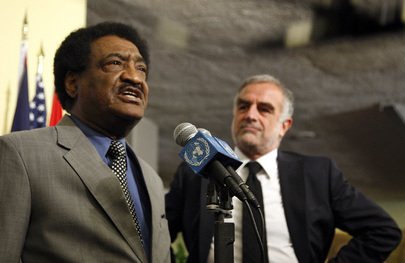 And in Sudan, the UN Mission in Darfur covers up killings. UN Peacekeeping chief Alain Le Roy told Inner City Press he will look into it. What will the US do? Watch this site. Update of December 13: Inner City Press is informed that as regards Austria, the foreign ministry is "providing some financial support for the airfares for the three kids." Duly noted. So rather than ask about the danger of it being an event for rich kids, might it not, without the UN or US taking precautions, be an event disproportionately for kids from richer COUNTRIES? Watch this site.